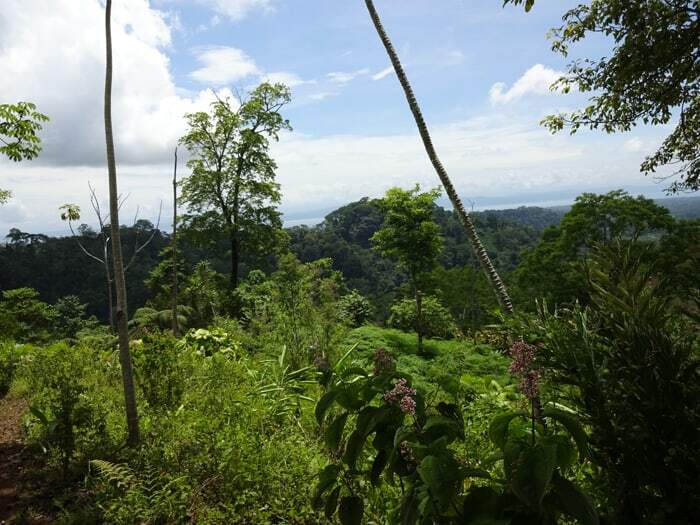 CORCOVADO NATIONAL PARK, Puntarenas — Our first hour on the trail to Corcovado from the new entrance at El Tigre was grueling, with a long, steep uphill slog in the heat of the Costa Rican morning. Then there was a nice rest stop where we sat down to chug water and watch our redoubtable guide Tomas climb a mango tree to pluck juicy fruit for us to devour. “I want to see a snake,” I said. 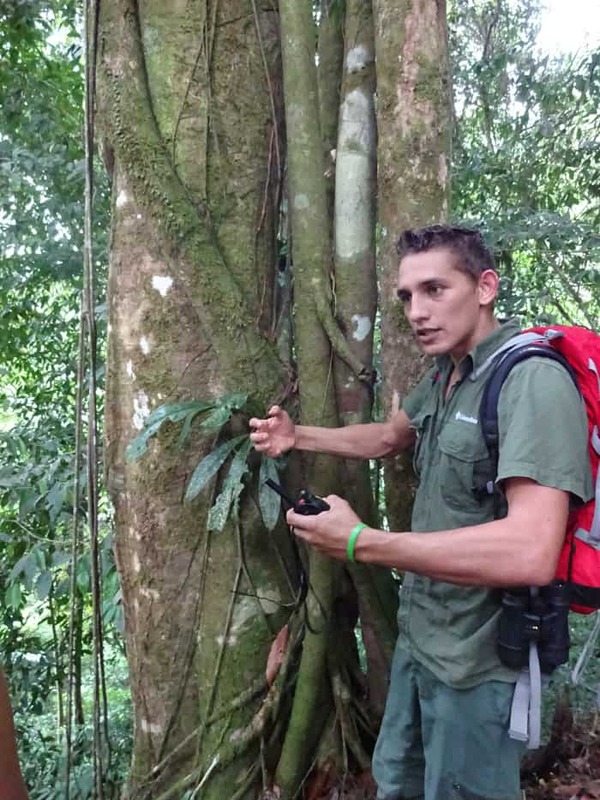 Tomas went on telling us about plants and trees, and on another rest stop he impressively climbed the inside of a giant strangler fig that had suffocated its host, leaving nothing behind but the huge, hollow matapalo (“tree killer”). Then Tomas motioned for us to stop. He waved his hand around the leafy area to the left of the path and asked if we could see anything. I saw nothing. “Did you find a snake?” I asked. I uttered a barnyard expletive suggesting that he was pulling our legs, but with a shake of his head he assured me he wasn’t. 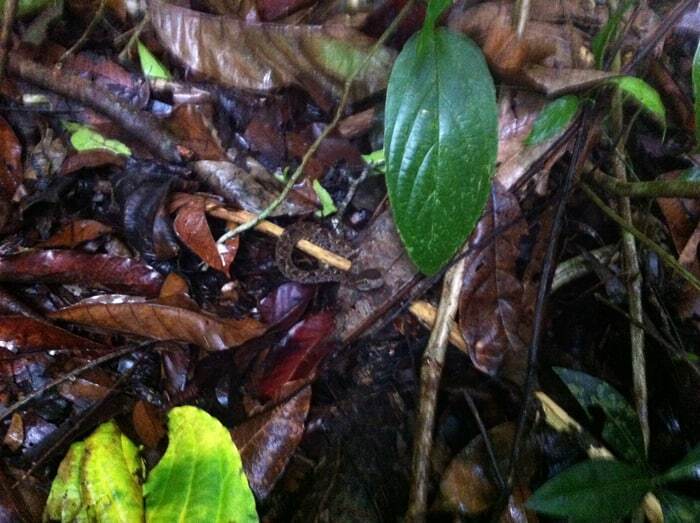 The terciopelo, also known as a fer-de-lance, kills more people in Costa Rica than any other snake. 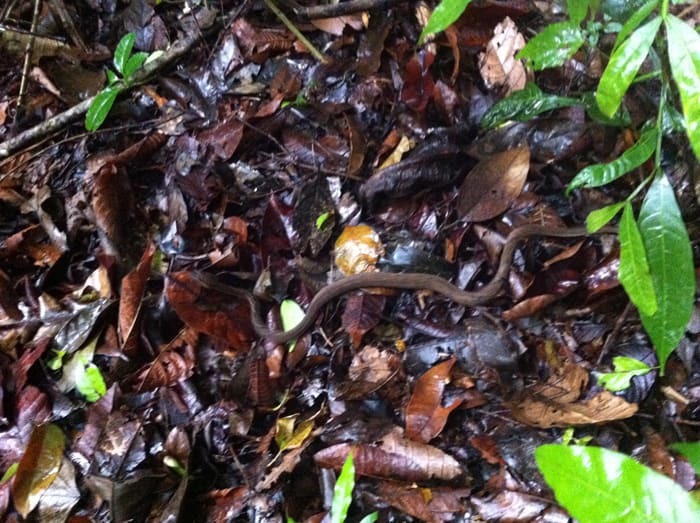 I had to stare at the wet brown leaves for almost a minute, Tomas pointing with a stick, before I saw the thin, brown viper coiled up among them. “It’s a little one,” said Tomas. He got the snake’s attention with a stick and it slithered to a new spot, revealing that it was about 15 inches long, maybe 38 cm. When Tomas approached it with the stick again, the snake coiled into a posture suggesting that it was done running and was going to stand and fight. There we left it, with neither side harmed — not the way many human-terciopelo encounters end in this country. Tomas Ridings, 25, our outstanding guide and uncanny wildlife spotter Friday, comes with a fascinating backstory. 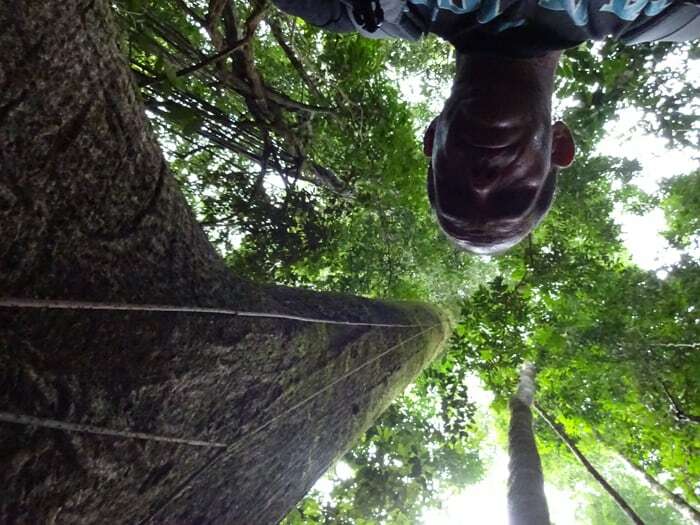 He became familiar with these forests by spending years hunting and mining gold in and around Corcovado — two of the pursuits that most frustrate preservation efforts at this park. But an uncle who was a guide started putting the idea of conservation into his head, suggesting that he should take the skills he had learned from hunting and apply them to leading nature tours. When Tomas went on one of his uncle’s tours, he found his calling. Tomas’ bad-boy start in life turned out to be the perfect preparation for a job tracking animals for tourists. 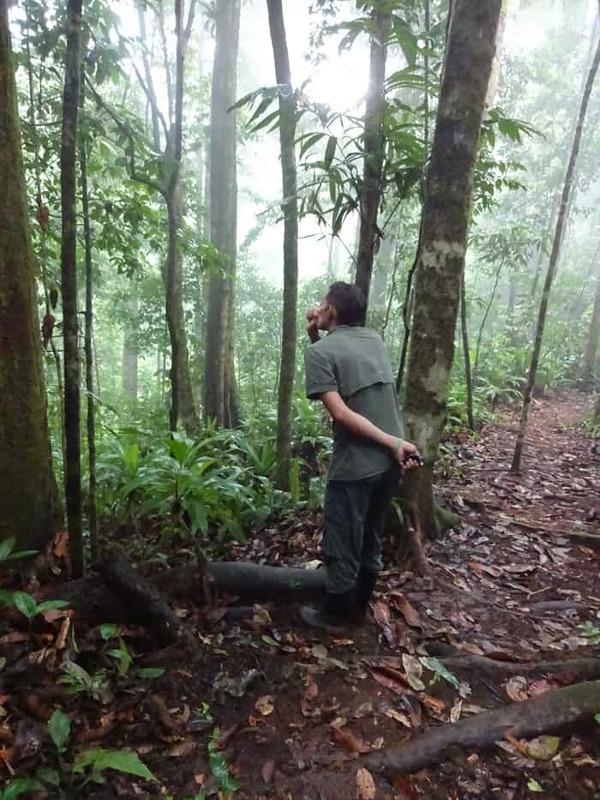 He has uncanny skills at spotting and identifying tracks — on our seven-hour hike Friday, we saw what he said were armadillo, coatimundi, peccary, deer and tayra tracks, and he sniffed out trees that peccary had marked with their musk. Tomas also has an expert ear for bird calls, for the sound of a deer in the brush or monkeys swinging through the trees, and he is skilled at imitating bird and animal calls. 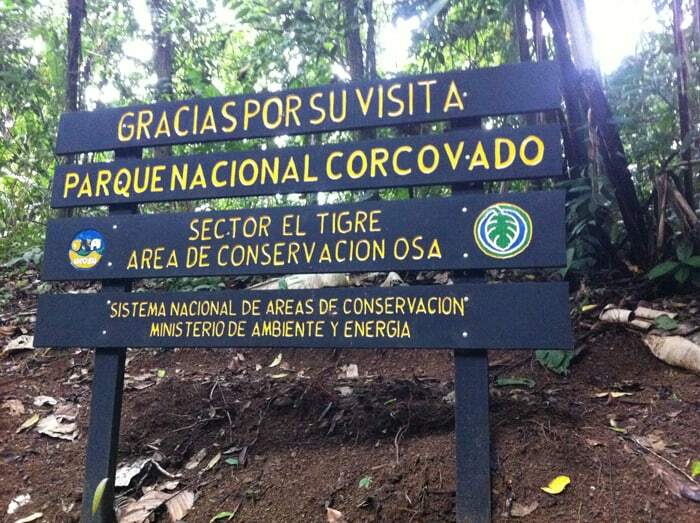 Corcovado is bigger, wilder and has more animals than any other park in Costa Rica, but it’s never been easy to get to. If you have the money you can fly from Puerto Jiménez to Sirena in a tiny plane, or you can take a boat from Drake Bay, or you can take a long, bumpy bus to Carate and then face the long hike to Sirena. With any of those options, you have to spend the night either in the park or pretty close to it. The El Tigre trail offers a new way to see the park without spending the night there. You can hit this trail at 6, 7 or 8 in the morning and be drinking a beer in Puerto Jiménez by 5 o’clock. 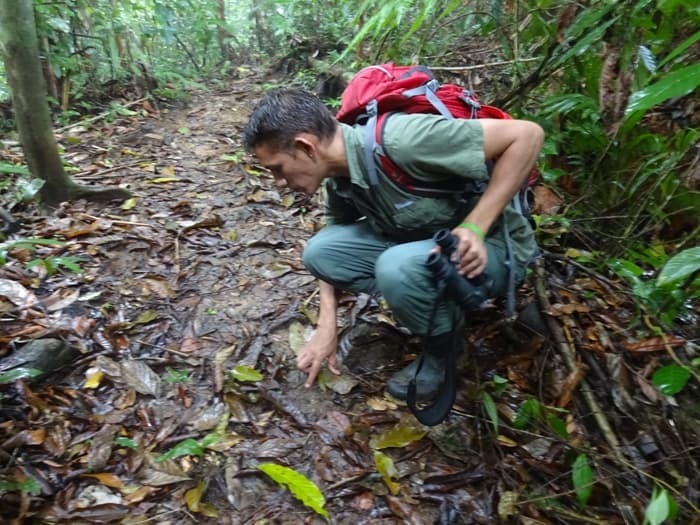 Bear in mind that you’re far more likely to see a tapir or a herd of peccary on the more remote trails that connect Los Patos, Sirena and La Leona. The animals there have been habituated to human contact for decades. It will take the animals at El Tigre some time to figure out that the humans on these trails are harmless. But Tomas thinks it will happen fast. 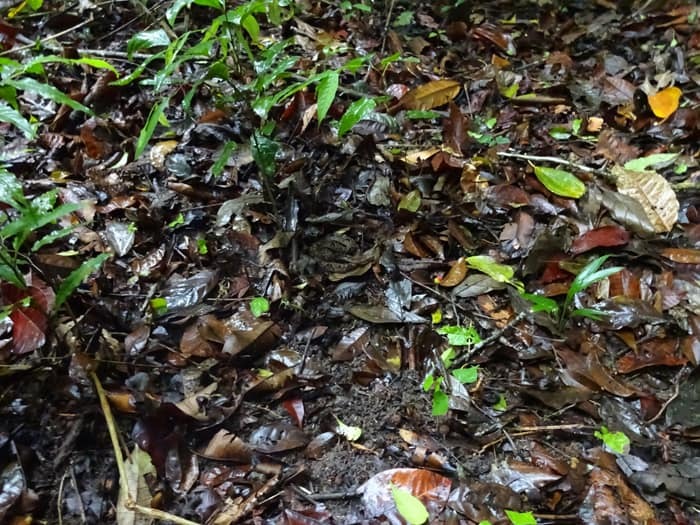 The mammals he personally has spotted on this trail include peccary, spider monkeys, capuchin monkeys, howler monkeys, coatimundi, armadillo, ocelot, anteater, kinkajou and bats. He has seen green and black poison dart frogs, eyelash pit vipers and fabulous toucans. He’s seen the prints of pumas and tapirs, and he said someone else saw the prints of a jaguar and another person heard the jaguar roar. We saw no mammals until one of our group spotted a bat hanging from a tree. “At least we can say we saw one mammal,” I said. But on the very last leg of the trail, as if to save the best for last, we saw three: a big family of coatimundi moving through the brush, a troop of spider monkeys swinging through the trees and even a three-toed sloth, a gray clump clinging to a treetop. Tomas said it was the first sloth he had ever seen on this trail. I asked him how many visitors this new park entrance had attracted since it opened earlier this year. “We’ve had about 60 people,” he said. Great zot! I have discovered a hidden gem. This is among the wildest day hikes you are likely to find anywhere in this country. Hiding in plain view, 20 minutes from Puerto Jiménez if you don’t get lost, is a virtually unknown entrance to what is invariably called the “crown jewel” of Costa Rica’s national parks. The trail starts on protected “reservas” outside Corcovado, climbs steeply uphill for the first hour and a half, enters the national park, levels out and eventually leads back down. On a difficulty scale of 1 to 5, where Manuel Antonio is a 1 and Chirripó is a 5, I would rate El Tigre a 2.5. It’s a moderately difficult hike because it starts with a long uphill, after which it’s just long. But I predict that in just a few years, El Tigre will be huge. 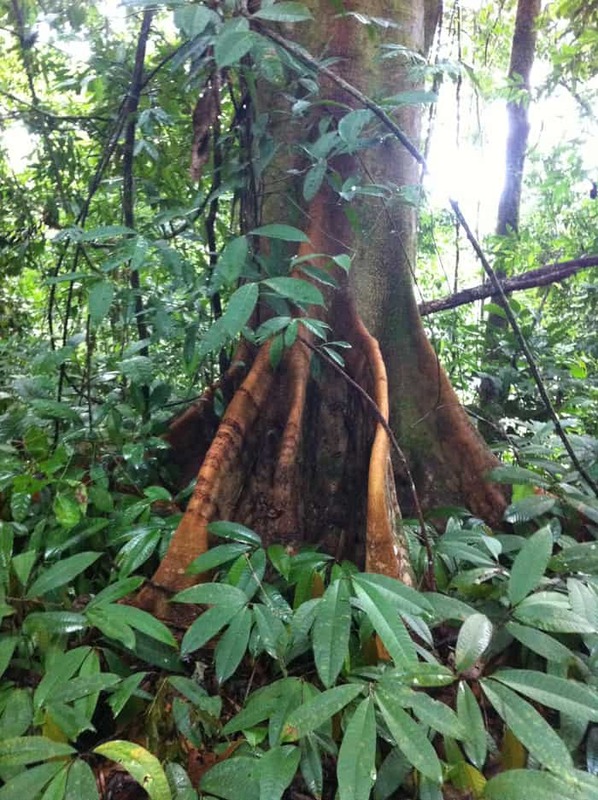 There’s nothing easy about this trail, but it may be the easiest way to see Corcovado. Tomas will be ready. Just 25, he already owns protected land on the reservas at the entrance to this treasure. His dream is to open an ecolodge someday. 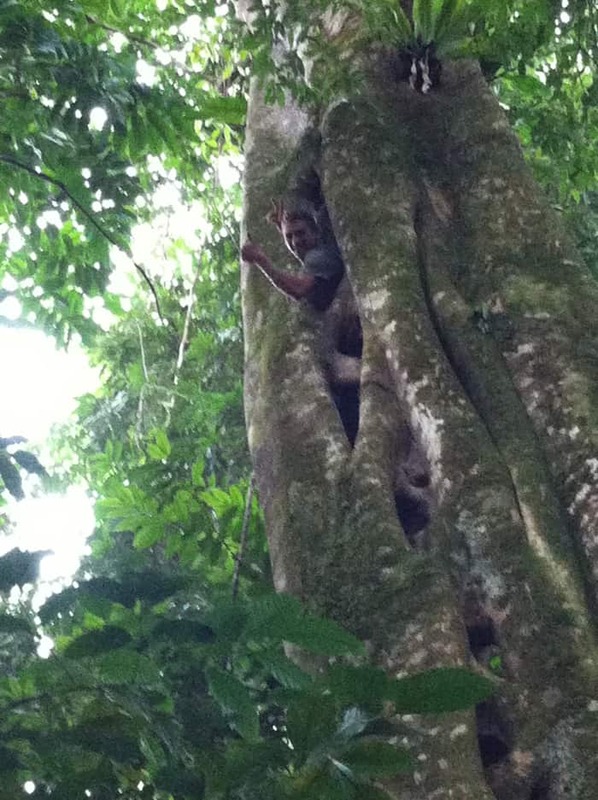 Until then, he will be leading tours at El Tigre — and it’s hard to imagine a better guide anywhere in Corcovado. Getting there: Driving five minutes north of Puerto Jiménez on the main highway, the left turnoff to the El Tigre trail to Corcovado National Park is clearly marked, but signage is lacking after you turn onto this gravel road. Just past the soccer field in a small town, several signs at a junction point left, including one to Chocuaco Lodge. Turn left here and drive down a long gravel road past the Chocuaco Lodge until you see the parqueo for El Tigre. Cost: $75 per person with required guide; discounts for groups negotiable. Hours: Fully staffed Monday to Friday, with a half-day on Saturday and Sundays off except by appointment. What to bring: Twice as much water as you think you’ll need, lunch or snacks, insect repellent, closed hiking shoes or boots, Ziploc bags to protect phones and cameras in case of rain. Shorts are OK but lightweight long pants will deter bugs better. Be prepared for rain.